A Rainbow baby? and a Holiday to Thailand!! For this post I’m going to have to backtrack just a little bit to give you a bit of background. On the day that Liam died, our OB came into our room a couple hours after he had passed to answer any questions that we might have had. One of the questions that we asked was “when can we have another baby” it was not that we were disregarding Liam, it was just that we were so eager to hold a living baby in our arms, and to give Alethea a living sibling that she could bond with and play with just like all her other little friends In a way it was a little ironic to ask this question, as only 48hrs previously I had said to Ryan “If ever I feel the need to have a 3rd child can you please remind me how hard this pregnancy has been, and how bad I have felt for 9 months, please try and dissuade me from having any more children after this one, because I am very happy with 2” and yet here I was on the day that I had given birth asking how long I needed to wait before trying again. Our OB told me that as soon as I was mentally ready we could try straight away, that my body would handle another pregnancy within the next couple of months. Over the 3 days that we were in hospital a couple of the midwives asked us if we would try again and to them we replied that we were not yet sure, and I remember one midwife telling me that before we fell pregnant again that we needed to get a referral to a specialist and get things “sorted out” she told us that because we had been left open for a long period of time that my uterus would contain adhesions and they would need to be sorted before pregnancy could be achieved, and that could take nearly a year to sort out. I always had this in the back of my mind, and for some reason it was just truth to me, so we went about for the next few months believing that I needed to see a specialist otherwise I wouldn’t be able to fall pregnant. After everything had settled down at home, Ryan asked me whether we should try for another baby, however by this time I had decided definitely not, there was no way that I would ever be able to handle being pregnant again, and I was content and more than happy that we had a beautiful healthy, cheeky, headstrong little girl. However I could see that Ryan really wanted to try again, so I agreed to go to my GP to obtain a referral to a specialist, in the back of my mind I had thought that if indeed it took a year to sort out, by then I might actually want to be pregnant again, and if I waited until I wanted to fall pregnant before sorting things out it would cause a further delay. My GP referred me to a specialist that a lot of my friends from Deb and Belinda’s group had already seen, he specialised in helping women who had traumatic births and babies who hadn’t made it, fall pregnant again, when I rang in September to book an appointment part of me felt like I was betraying Liam, that I was not honouring him by trying to have another baby, but the other part of me in truth was a little excited, maybe our family would eventually be bigger than just the 4 of us. I was unable to get an appointment with this Dr until late November, but I was ok with that, because I was really in no hurry. One week before Alethea’s birthday around the 21st of October, I remember it was a sunny Sunday morning. Alethea and Ryan were out in the back yard and he was watching her do ‘tricks’ on the trampoline. I looked at Ryan and said to him “Honey, I think that I could be pregnant” I had thought I was pregnant for a few days and had purchased a pregnancy test, but hadn’t yet used it. He looked at me and said, “That’s not possible is it? We haven’t seen the specialist yet, and you can’t fall pregnant because of the adhesions” I told him that was what I thought, however I had also been pregnant many, many times before and I was acutely aware how my body feels at the beginning of a pregnancy. I told him that I had bought a pregnancy test and that I thought that maybe I should give it a try just to see what it said. So I went inside and did the pregnancy test. I waited the allocated time upstairs and didn’t look at the test once until time was up, when it was I took the stick in my hand and there were 2 lines, my heart both skipped a beat with excitement and sank at the same time. I was both ecstatically happy and horribly sad at the same time. I came downstairs and Ryan looked at me expectantly. I couldn’t speak but handed him the test. He gave me a huge cuddle and told me that together we could do it. I had some Clexane injections from Liam’s pregnancy left over and gave myself one straight away. Ryan asked when our baby was to be due and tears filled my eyes, my heart when up into my mouth as I told Ryan that my last menstrual cycle began on the 23rd of September, we had conceived this new baby exactly 1 year after we had conceived Liam down to the day (how does that happen?) but due to the fact that 2012 was leap year there had been an extra day in February and therefore Liam had been due on June 30th, as there was no leap year this year, this baby was to be due on July 1st. What is a Rainbow baby? I had read a few discussion groups where mums were expecting their ‘Rainbow baby’ and I realised that this was a term given to a pregnancy after another baby had died and I wondered how this term came about. So I did a Google search and came up with this: in the real world, a beautiful and bright rainbow follows a storm and gives hope of things getting better. The rainbow is more appreciated having just experienced the storm in comparison. The storm (pregnancy loss) has already happened and nothing can change that experience. Storm-clouds might still be overhead as the family continue to cope with the loss, but something colourful and bright has emerged from the darkness and misery. I thought that it was a perfectly beautiful way to describe this pregnancy, and so my rainbow baby pregnancy started. That first week I needed to arrange to see my GP for further supplies of the Clexane, as we were to be travelling to Thailand just a few days after Alethea’s birthday. When I met with her she was just as surprised that I was that I had fallen pregnant and gave me many options on which OB to go with for this next baby and where I should deliver the baby. For me the most important thing was to be in a big teaching hospital. I wanted a place where theatres were there 24/7, I wanted somewhere where there was a NICU should this baby require it, and I wanted experienced Drs available at all hours of the day (not just on call) within the hospital to be able to drop everything and run to this baby should he or she need it. (For the purpose of my posts I am going to call this baby ‘he’ as that is what I have done with each pregnancy, it seems nicer than saying ‘it’ but by no means does is mean that this baby is a boy, in fact I remember when I was pregnant with Alethea I told Ryan that if she came out a girl she would have a gender crisis because I had called her he for 9 months!!) I decided that I would have our baby at RNSH and my list of OBs was drastically narrowed down as most of the ones that I called only delivered in private hospitals, and there was absolutely no way that I was going to go down that road again! After Alethea’s birthday our little family needed to pack to go to Thailand!!! We were really looking forward to both the wedding and a little holiday. 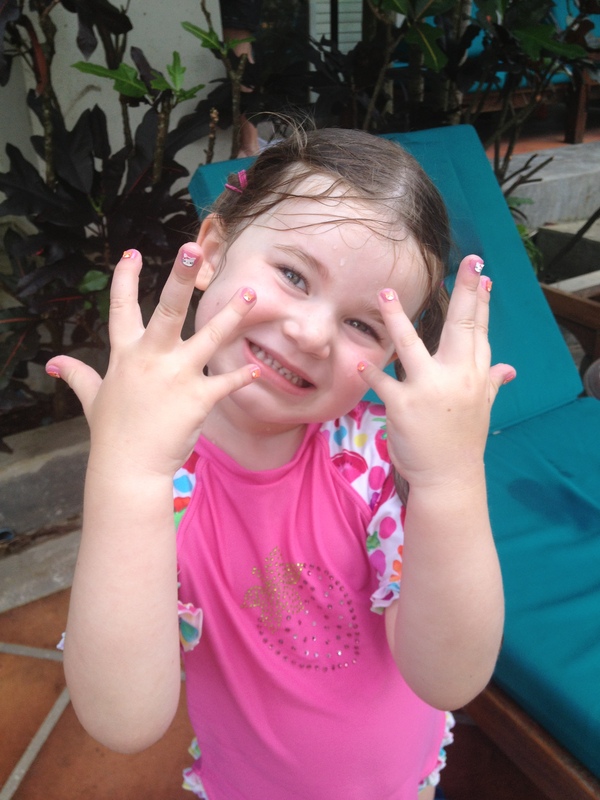 Just a couple of days after Alethea turned 4 we were off on a plane and very, very excited and happy. Ryan and I, although acutely aware that I was pregnant were trying very hard to ignore the pregnancy and just enjoy ourselves, we had been through many, many pregnancies before, and most of them had ended not long after they started and we were very much aware that the same was very likely to happen this time. The flight to Thailand was long, but Alethea had been perfectly well behaved and I was really proud of her, however by the time we finally arrived it was around 11pm (Australia time) and Alethea was just way over tired, and not being a child that day sleeps she was still awake. At the airport I became like a lioness protecting her cub, even though we had met up with half the other plane who were also attending the wedding and staying at the same hotel, I waited for no one, I was first through immigration and first to exit the building, I was carrying Alethea just wanting to get her to bed, she was exhausted. We found the first available taxi driver who drove us to the hotel in the same fashion that Michael Schumacher would drive. I was very nervous as in this taxi Alethea had no seat belt, so I told Ryan to please watch the traffic as although I had her firmly held, he would be needed in an emergency to help embrace her, (yes I know overprotective lioness!!) From what I can gather, we arrived to the hotel at least 30mins before the next person and by then I had Alethea safely tucked up and sound asleep in bed. Our first day in Thailand was superb. All the kids had woken early (as their body clocks had not yet adjusted) and at 6am we were with most of the other wedding crew (the ones who had kids anyway) eating breakfast, the weather was warm and lovely and not long after that all the kids/parents were in the beautiful pool which was warm and inviting. 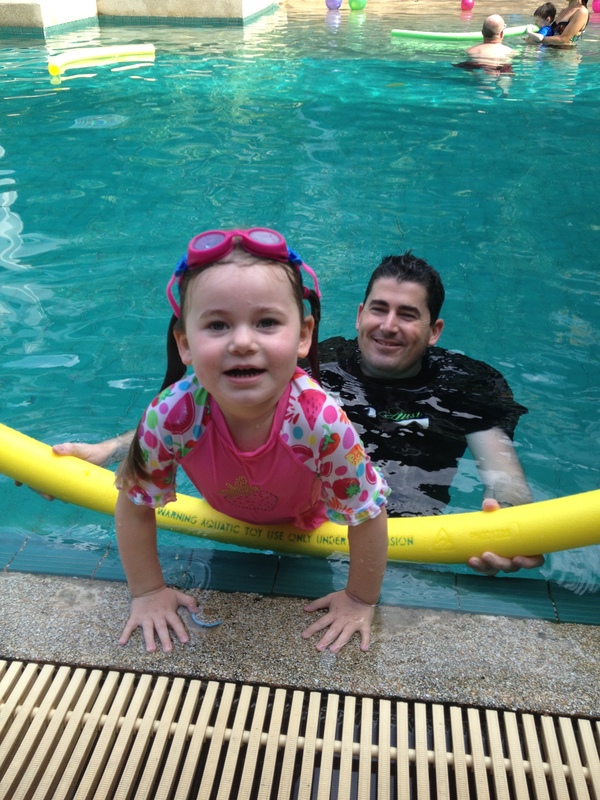 Alethea LOVED it, she splashed around, played with her cousins and the other kids and loved being around our family. During the middle of each day that we were there for around 1.5-2hrs we stayed in the hotel room as it was just too hot to function doing much else and Ryan and I would read books and have some quiet time with just the 3 of us. On our second night there (or the first full day that we had there) we had the girls hens night. Jen, the gorgeous bride to be, had not long found out that she was pregnant (from memory I think she was around 14weeks), and so was one of her bridesmaids (who was about the same stage along as I was) and also a couple of the other girls were in the early stages of pregnancy. This suited me quite well because it meant that I could do similar things as the other girls without drawing too much notice to myself (we had decided to keep this pregnancy a secret). We went to one of the most beautiful locations that I had ever gone to for Jens hens party, located around 30mins outside Phuket on a beautiful beach it was magical, it felt surreal to be in such a beautiful spot in the world. The night was lovely, tamer than I originally thought it would have been, but given that every second girl was pregnant it was understandable! I’m pretty sure that the next day that we were there the boys bucks party was held, it was an all-day most of the night affair, so Alethea and I had the whole day to ourselves. We played in the pool together (along with some of the other girls and kids) we went out and had a “girl’s lunch” just her and I and then we went and got our finger and toenails done. We sat in the salon for at least 2hours being pampered and my 4yr old loved every second of it, she chose to have some little kittens stuck on her nails and the ladies there were so good to her. It is hard to describe in words how much I love this little girl, I just want to squeeze and cuddle her the whole time! That night the buck’s party finished (actually I think it was still going but my hubby was carried home at around 1am) and he was in a terrible state. Generally speaking Ryan isn’t a big drinker, he does have the ability to hold his alcohol well if, and when he does drink, (I think that has something to do with his size), but after drinking for about 12hours he was in a terrible state! He went to have a shower and when after a while I went into the bathroom my poor hubby had gone to sleep on the bathroom floor. Being about 6ft 3, and nearly double my weight there was nothing that I could do for him other than put cold towels on his forehead every 30mins or so, until at around 4am when he was able to have a shower and come to bed. Alethea and I got up very early that day and left the unit as quickly as we could to give her daddy a good sleep, however by around 11am I thought that it was time to wake him up, I had only had around 2hours sleep the night before as I had been looking after him and I was exhausted, so it was time to wake the sleeping giant and make him face the day…..I think it will be a long time before Ryan repeats his actions that night, they are still vivid in his mind! The rest of our stay at Thailand was magical, yes we thought about Liam all the time, but it really wasn’t with as much sadness as we had previously done, our hearts were beginning to heal and we were able to laugh and enjoy every minute of our time away. On our last night in Thailand I took both Ryan and Alethea back to the beach that we had Jen’s hens party at, I had decided that this was the most beautiful location to let a lantern off and send up to Liam, (see the photos below to understand what I’m talking about if you haven’t been there or seen one of these before). 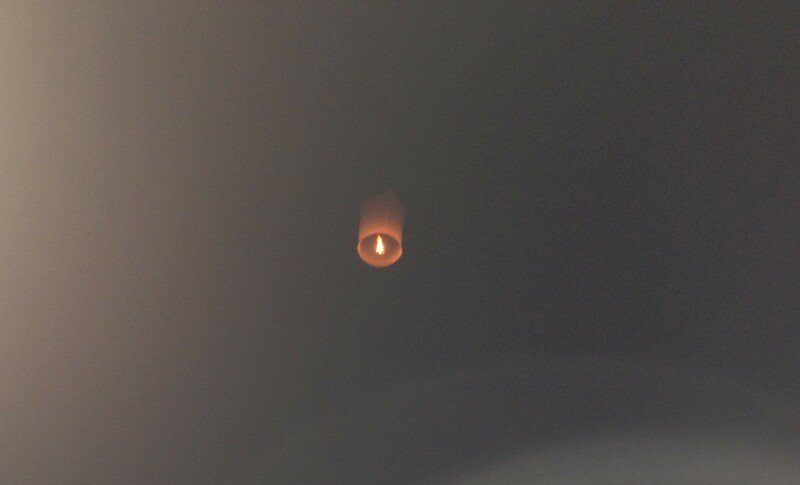 We sent up a single lantern for him and watched until it could be seen no more, not long after we had sent our one up a group of birthday partiers sent up lanterns for their birthday boy and around 15 lanterns went up to honour this persons birthday, in a way it made me feel bad that we had sent only one up for Liam, he deserved the whole sky to be full of lanterns just for him, and I thought about buying lots, lots more and sending them up for him, but decided that our 1 lantern was all that was needed, hopefully he would know how much love we had for him, hopefully he could see that we sent it up especially for him. Our Thailand holiday had been packed full of fun and laughs, we had canoed around James bond Island, visited the monkey temples, gone to the Thailand zoo (an experience in itself!!) had a ride on the elephants, shopped, sun-baked, gone to the beach, had massages spent time with family who we loved, attended Ryan and Jen’s magical wedding, but most of all we relaxed and felt ‘normal’, it was most amusing to watch my little girl walk in front of us down the main street in Phuket and fend of the salespeople by herself “no thank you” she kept telling them “we don’t need that” and they would laugh at her. She had her ‘own money’ to pay for things and we indulged her in almost anything that she wanted; she LOVED Thailand and often asks us when we are going back there. We were gone from Australia for between 10-12days (I can’t really remember) and when we returned life returned to ‘normal’ our time away had brought my little family even closer together than it had previously been, we had found peace, we had found happiness and we had found a balance of missing Liam, honouring Liam yet still enjoying our lives to the fullest. The first Friday that we had back in Sydney I arranged an ultrasound to see if this new pregnancy was still here or had it indeed come to a halt as I expected it to have. I didn’t tell Ryan that I was having the scan, I wanted to either surprise him with the good news, or wait until he had finished work and let him know the bad news. As the lady put the ultrasound probe on my stomach tears filled my eyes, I could see the flicker of a heart, our baby was still alive, he was in there growing by the day and I had no symptoms whatsoever. I drove straight to the city to surprise Ryan, and have lunch with him. I showed him the first photo of our little baby and his face lit up with ecstatic delight, he couldn’t believe that I had kept the scan secret from him (really I’m not good with secrets, and I am an atrocious liar, I normally just blurt everything out!) so our journey with our rainbow baby continued. ← Moving Forward…and a Party for a Beautiful 4yr old! I had to do this also, I was holding my breath! I don’t know why but for some reason I look forward to your blog entries, I cannot explain why. Thank you for blogging about Liam…I really hope all is well for your little family. It sounds like your little Rainbow baby wants to be here and I cannot wait to hear about it. Thank you for continuing to share your story. You have just made me smile. I am sure that Liam is watching over his Babi (how my son refers to his little sister). Continuous prayers for you and your family Amanda. Take care. I have a smile from ear to ear.. A huge congratulations to you all!! OMG, I am now holding my breath waiting for the next instalment. You must be so very close to having your gorgeous bundle in your arms. Oh so sweet. Now Liam will be a little bother AND and big brother too! Normally I don’t comment on pages or blogs, but today I had to. I started reading your blog at the beggining of this year when a family friend lost her baby just like your beautiful Liam. Your blog has made me cry and sob and smile. Again tonight I just burst into tears reading this, I could not be more happy for you and your family. I have to say that I also did some serious speed reading on this post and I hope that you are beaming and beautiful! So, so happy for you. Congratulations! I’m so happy to hear some good news as ive missed your posts and hope it’s all going well. Your truly one amazing woman! Hope you don’t mind me asking but would you go to Thailand later in your pregnancy?? I am so unbelievably thrilled for you and your family and for the healthy delivery of your newest addition. I cannot fathom the heartache you have endured during this past year and while I know this new baby won’t heal your heart, I am excited for the joy he will bring to it. Congratulations! Anxiously awaiting further updates! Beautiful I am still crying so so happy for your little family. Gorgeous and what a beautiful holiday! You write beautifully and thank you so much for allowing others to share your family’s journey. I’ve learned so much from reading your blog. I have followed your posts from the very start. I am so so so overjoyed for your family. Such a special time for you. A sibling for Alethea and Liam! Truly special. I wish you all the best. You’re a very strong, loving and special woman. Thank you for sharing your journey with us.